Three days after the bombardment of Fort Sumter, on April 15, 1861, Lincoln called for 75,000 volunteers to enlist for three months. Soon after he called for an additional 42,000 men to sign on for three years, and provided large increases in the army and navy budgets. The purse strings were now loosened, yet lack of planning in the North and poor resources in the South meant that the campaign at sea got off to a slow start. Similarly, time was needed to build up armies from scratch. The Union Navy received an increase' of 18,000 men, and in July, as it became obvious that this was not going to be a short campaign, Lincoln asked for an additional 400,000 men for the army. Once started, the South organized more quickly than the North as its State militias had been on partial alert since the first states has seceded and President Davis had increased his first call for troops to 400,000. Despite having far fewer men at its disposal - about one-third of those in the North - by midsummer the South had nearly as many men under arms. It had long been anticipated that Southern shipbuilding facilities would not be able to cope with demand, so by August 1861 Mallory had already contracted for several powerful ironclads in the west. Here again the South was well in advance of the North. Few Southern shipyards were of sufficient size, and plants for the manufacture of machinery and armor were also inadequate. Of the ten yards belonging to the US Navy in 1860, only two were in the South - one at Norfolk, and a smaller one at Pensacola, which was better suited to refitting vessels, although it had built several large warships. 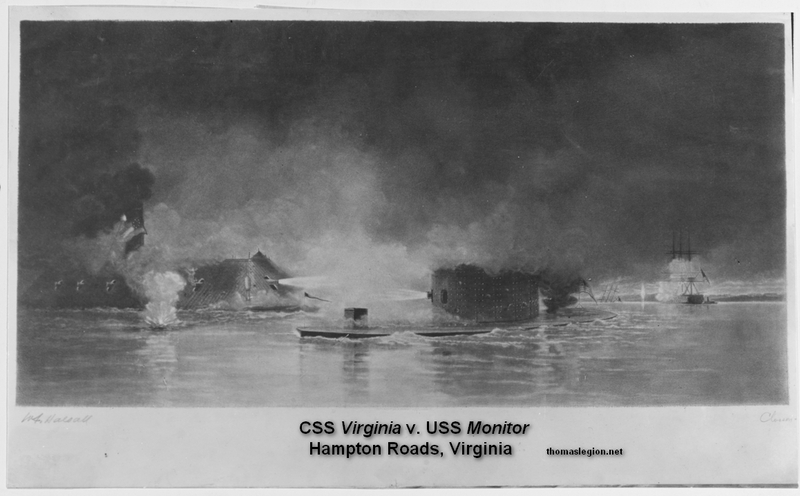 Norfolk was a far superior facility, having constructed thirteen major warships prior to 1861. But even this potential source of large output would not be enough when compared with the enormous shipbuilding resources of the Union which had many well equipped navy yards and an abundant supply of private companies. Many small concerns sprang up in the South, but these were often sited on a riverbank in a hastily prepared clearing and frequently lacked adequate facilities. In 1860 there were only thirty-six regular shipbuilding yards in the soon-to-be Confederate states. Between 1849 and 1858 the volume of ship construction throughout the United States was enormous. More than 8000 vessels were built, 1600 of them in the South. Most of the larger craft in the Southern quota were built at the important coastal towns of Norfolk, Charleston, Savannah, New Orleans, and Mobile. Later, small towns, which were often located miles up twisting, shallow rivers, would play an important part in creating a navy, especially after the fall of New Orleans and Norfolk in mid-1862. By then the main need was for small, shallow-draft, well protected craft able to navigate Southern waters. As luck would have it, these were the very type of craft that such yards could produce. When vessels were all built of wood, the South had no problems in finding materials; the difficulties began when iron was introduced. In 1860, from a total of ninety-six foundries and eighty-two rolling mills, only eleven were of sufficient size to meet production needs. In the Union Pennsylvania alone could swamp the entire output of the South. Similarly, the production of suitable machinery was a constant headache and many Confederate ironclads were lost through inadequate motive power. In 1860 there were nearly 100 engineering establishments, but most of them were small. However, a few larger companies, such as Noble's Foundry at Rome, Leeds & Co. and Clarke Foundry at New Orleans, Skates at Mobile, and Shockoe Foundry at Richmond did their best to cope with the flood of work, but no matter how hard they tried, they were thwarted by the ever-increasing shortage of skilled workers. Ordnance was another limiting factor in the success of the South, as in 1860 only Tredegar Ironworks could cast guns. (In the sixteen years prior to that date Tredegar had cast nearly 900 guns). Later, other foundries and ordnance centers, such as the one at Selma, were established, but these had to compete for the limited supply of iron and manpower. New Orleans was the obvious center for shipbuilding in the west, having a well established record going back to 1819 when the first shipyard opened. From then on many of the river steamers were constructed here; by 1860 there were five yards in the city, with five more spread out in Louisiana itself. By the time New Orleans fell in April 1862, more than thirty warships had been built or converted there, but again, these figures are small when compared with the North, where, by the end of the war, several small private companies would have produced almost as many vessels, often of a more advanced design. Such comparisons highlight the tremendous disadvantages faced by the South and make her lengthy resistance to the North even more remarkable and praiseworthy. Transport caused the South difficulties throughout the war. In October 1861 only a portion of the iron plate rolled for Merrimack (Virginia) by Tredegar Ironworks could be delivered as all the railroad stock was in constant use by the army. When Tredegar reworked the main shaft for the Mississippi, then being built at New Orleans, it took nearly a month to make the long journey on a specially built flat car and arrived only a few days before the city fell. For some of the new interior construction sites transport problems were still worse, as they were not even connected to the railroad. Richmond in Virginia, Edwards Ferry and Whitehall in North Carolina, Mars Bluff in South Carolina, Safford and Columbus in Georgia, Yazoo City in Mississippi, Selma, Montgomery, and Oven Bluff in Alabama, plus Shreveport in Louisiana were all yards where it was difficult for supplies to be delivered. These inland yards completed nine ironclads, but another eight ironclads and six wooden gunboats were destroyed before they became operational to prevent them falling into enemy hands. Like the North, the South could not at first produce 2-inch plate. Eventually three companies were able to produce armor of the required thickness, but it was a lengthy business. At the same time, the Confederate Navy Department tried to start up new rolling mills, but without success. The poor rail network in the South reflected on the amount of iron produced at the Tredegar Ironworks. Although that establishment could handle 24 ' 000 tons, only 8000 tons could be delivered in a year. In fact, at one time Tredegar was closed down because of lack of iron. Poor transport was not the only reason for this; the Union had made a point of occupying those parts of the South that produced most of the iron ore.
Common to both sides was a shortage of skilled labor, but it was far worse in the South as many of the workers in the machine ships were alien and left in vast numbers once the war started. Much of the remaining skilled workforce was taken into the army. In spite of all the problems, the South did remarkably well to achieve what it did. One of the North's greatest achievements was to develop a navy almost from zero. It began by purchasing or chartering all suitable vessels, quickly arming them, and rushing them into service with crews who, in many cases, were as fresh to naval service as the ships, themselves. Within a year a vast construction program was under way. About 300 vessels were added to the navy and these started to make the blockade effective. By the end of the war, 418 vessels had been purchased, of which 313 were steamers. An extra 208 warships were built under contract, and over sixty of these were ironclads. There was great variety in the ships designed for the US Navy, ranging from fast cruisers needed to pursue the Confederate raiders, to shallow-draft ironclads and gun-boats needed on the Mississippi and elsewhere. One of the most successful developments was the double-ended gunboat, which was able to maneuver so well in narrow, twisting rivers. In 1861, US Navy personnel numbered about 1000 officers and 7500 men, and although there was no naval reserve, there were abundant merchant seamen to call on. By 1864 the numbers had risen to 6000 officers and 45,000 men. It was important for the navy to be seen achieving victories without aid from the army, so Gideon Wells, Secretary of the Navy, insisted that New Orleans be captured by the fleet, and that Charleston should also be taken as the North considered it to be the seat of the rebellion. Supplying such a large and far-flung navy needed thorough planning, and required the establishment of store ships and well-equipped repair yards. In 1864 coal consumption amounted to over 500,000 tons, and this, together with fresh water, had to e regularly transported long distances to warships, especially the smaller ones which lacked adequate storage facilities. Viewed against the huge Northern force, the chances of sustained Confederate success were always limited. Nonetheless, they fought on, and although the raiders were not particularly effective in combating the Union blockade, they almost succeeded in driving the Union merchant flag from the sea. However, Union trade itself was not destroyed. When the European harvest failed in the early 1860s, the bumper crops of the Midwest were still sold to eager Europeans and trade generally continued to flourish. In the end the Union Navy tipped the balance, as the blockade slowly strangled the Confederacy and kept out desperately needed supplies., It took some time, however, before the true effect of this slow process could be seen. Interestingly, as early as December 1862, the South had asked Emperor Napoleon of France to propose an armistice on its behalf. Although Seward, the Secretary of State, favored the idea, President Lincoln was strongly opposed to any cessation of hostilities. In the summer of 1864 the Union faced a dark period of the war as the country seemed to tire of the conflict. Battles such as those at the Wilderness and Cold Harbor cost the North over 55,000 casualties against the South's 25,000, but the latter could not so easily make up such losses. The South was now in dire straits: food was in short supply and morale was low. There had been a major defeat at Gettysburg and Rappahannock when General Lee was unable to force the Union Army back over the river, and the conscription drive in the summer of 1864 had been a miserable failure. Nevertheless, Union forces could not have won that dreadful war if the South had not finally surrendered to the relentless attacks of the Union Army and the subtle but definite pressure exerted by the United States Navy. Naval Battles of the Civil War is lavishly illustrated with rare contemporary photographs, detailed artworks, and explanatory maps, and the text is a wonderful blend of technical information, fast-flowing narrative, and informed commentary.